My name is Dr. Yuliya Klopouh, the founder of The Orpheus Health Clinic and a specialist in nutrition consultations. My career as a Doctor of Pharmacy teaches me to believe that disease treatments begin with disease prevention! This is my credo and I live by it as I help my patients stay healthy before they experience the signs of a disease. If you truly care about your health and would like to help yourself stay healthy, energetic, and vibrant for many years, you’ve come to the right place. Or perhaps you are someone that suffers from chronic fatigue, low energy levels, an inability to get through the day without drinking several cups of coffee, or just not feeling like you are in the best shape you want to be – then please read on. At The Orpheus Health Clinic and Organic Pharmacy I am dedicated to preventing disease, as well as bringing health and healing to patients. Using nutrition protocols and nutrients based on scientific and clinical evidence, I bring individualized optimal health and wellness solutions to everyone who visits The Orpheus Health Clinic located in Baltimore, MD. I will be able to assess your clinical condition, diet, and your current therapies. After a thorough history review and evaluation, I will be able to provide you with recommendations to improve your health. Specializing in Natural Organic remedies, disease prevention, and treatment plans for adults and children, the products we use in our practice range from organic and wild-crafted nutritional supplements to potent spagyrically processed homeopathic and botanical remedies. Your optimal health is my priority and ultimate goal, and I’m dedicated to bring back your vitality and radiant health. Yuliya Klopouh began her medical education in Kiev, Ukraine where she graduated from a Nursing School. She went on to the Kiev Medical School and was one of the top students in her class. She immigrated to the United States with her family in 1992. She continued her pursuit of medical knowledge in the United States. She received a Bachelor of Science degree from the University of Maryland in Baltimore County and continued her studies at the University Of Maryland School Of Pharmacy from which she graduated in 2000 at the top 5% of her class. Klopouh practiced as a clinical pharmacist for 8 years; her potentials were quickly recognized, and she was promoted to the Clinical Pharmacy manager at Northwest Hospital in Baltimore, MD. She was then promoted again to the Director of Pharmacy at the Greater Baltimore Medical Center. After dealing with very ill patients for years and often feeling frustrated with the inability of modern medicine to cure diseases, Dr. Klopouh realized that disease treatment begins with prevention. She then enrolled in the Global College of Natural Medicine to pursue the degree of Bachelor of Science in Holistic Health, Master Herbalist and Nutrition Consultant. Parallel to her academic pursuits, she founded The Orpheus Clinic which grew and is now a successful holistic medicine clinic. While being active in promoting holistic medicine, Dr. Klopouh also focuses on traditional medical and academic fields. She continues to work as Director of Pharmacy at the Greater Baltimore Medical Center and mentors pharmacy students from the University of Maryland and College of Notre Dame Schools of Pharmacy. 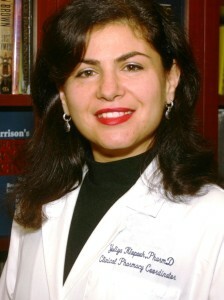 Additionally she was appointed as a Clinical Assistant Professor at the University Of Maryland School Of Pharmacy. Dr. Klopouh regularly gives educational talks in both traditional pharmacy and natural medicine areas. Most importantly, she would like to meet with you to help you achieve optimal wellness! Please contact her for an appointment at the number below.